The first Polish settlers of Orleans County began arriving in the late 1870s. Finding ample work in the fields and in the quarries, they soon let their fellow countrymen know of the opportunities the rural Western New York county offered. By 1883 the first factories had established themselves in Medina and soon Poles found work in them. Slowly but surely Medina’s Polonia developed. For their spiritual needs most of the Polish families attended St. Mary’s in Medina, while a few would travel to Albion to attend the Polish parish there, Assumption. As Medina’s Polish community grew, Mr. Henry Piatek began to organize the colony and lay down the ground work for a congregation. Soon a delegation approached Father Stanislaus Bubacz at Assumption in Albion about establishing a Polish Mission Center in Medina. On June 20, 1909 Father Bubacz celebrated the first Polish Mass for the congregation in the home of Wincenty Wysocki on Commercial Street. 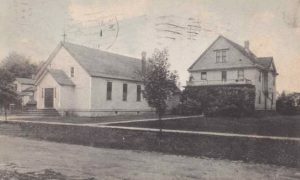 By 1910, the little Polish Mission flourished into a full parish and on February 1, Bishop Colton assigned Reverend Thomas Gwozdz as its first resident pastor. Before it was even formally established as a parish the members of Sacred Heart began looking for a place to build a church. The group had a couple of options, they could purchase the building on the southwest corner of Center Street and Orient or they could build new on a site at the corner of High and Ann Streets. After a short deliberation they decided they would build a church on Ann Street. Before the church could be competed the parish saw its first baptism. On August 7, 1909 Anna, daughter of Constantine and Veronica Buckiewicz was baptized by Father Bubacz. Josephus Labecki and Anna Lewandowski served as her godparents. Nicknamed the Little Bethlehem House, the church of the Sacred Heart of Jesus was completed and dedicated by Msgr. Nelson H Baker on October 15, 1910. As the church was being constructed, the Sacred Heart Society, an organization of 24 leading Medina Poles formed and purchased a plot of land on North Gravel Road to be used as a parish cemetery. The first interment of Sacred Heart Cemetery would be 20-month-old Victoria Paduchowski who passed away September 4, 1910. She was preceded in death by parishioners Joseph Marcinowski and Maryanna Struzewska who were buried at St. Mary’s cemetery. 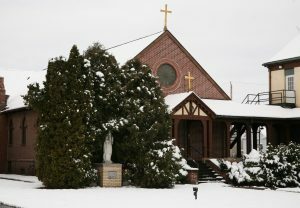 As for the Sacred Heart Society, it purchased a clubhouse on Gravel Road and became the Sacred Heart Club, a culturally Polish, secular organization. By 1925, the parish had grown to the point that a school was needed. Father Mioduszewski petitioned the Franciscan Sisters of St. Joseph to come to Medina and establish a school. A school was constructed, a matching brick veneer was added to the church, and on January 2, 1926 two sisters officially opened the parish school, admitting 62 pupils. The school taught hundreds of students until finally closing in 1969. In 1981, an arsonist torched Sacred Heart Church. The interior of the church was badly damaged and took two years to remodel. The parish survived the fire, but it couldn’t hold up to the economic decline of the region. 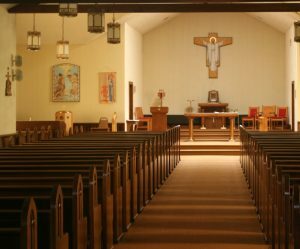 In 2008, as part of the Diocese of Buffalo’s Journey in Faith and Grace, the Sacred Heart of Jesus was joined with St. Mary’s in Medina and St. Stephen’s in Middleport to create Holy Trinity parish, resulting in the closure of the church. Karney, Alfred. "Medina: Centennial Jubilee Mass Celebrated at Sacred Heart."Ampoleagle.com. Am-Pol Eagle Newspaper, n.d. Web. 01 Feb. 2017. "PGSNYS" Polish Parishes of WNY - Detail. Sacred Heart of Jesus, n.d. Web. 19 Nov. 2016. "Sacred Heart Church." The Western New York Historical Edition of the Medina Daily Journal. Medina, NY: Medina Daily Journal, 1922. 30. Print. Scott, Mark. "Catholic Diocese to Close Eleven Niagara County Churches." WBFO. N.p., n.d. Web. 01 Feb. 2017. "Services of Their Own." Medina Daily Journal [Medina, NY] 21 June 1909: 3. Print. White, Ciel. "Historian's Scrapbook." Journal-Register [Medina, NY] 22 May 1984: 10. Print. White, Cecilia A. A History of Sacred Heart Parish. Medina, NY: n.p., 1976. Print.